Nice, clean with friendly staff. Downtown location nice for Astro's game. Non-smoking room had smoke smell. Very nice staff, friendly, helpful, and efficient. Great staff, even better cookies! Could not turn off shower completely. The full-service Doubletree Hotel Houston Downtown is a newly renovated property on the edge of downtown in the business and financial district. In addition, the hotel is within walking distance of the Houston Theatre District, Minute Maid Park, Bayou Place Entertainment Complex and the new light rail system, which connects downtown to Reliant Park Stadium. The recently expanded George R. Brown Convention Center, with more than 1.2 million square feet of event space, is also within a short distance. Greeted at check-in with signature, warm chocolate chip cookies, travelers for business or leisure will find the hotel more than suitable. 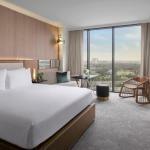 The hotels 350 guest rooms feature Doubletrees new Sweet Dreams Bed, with luxurious linens, floor-to-ceiling windows for views of the Houston skyline, alarm clocks, adjustable thermostats and newspapers on weekdays. Business travelers will appreciate the work desks with adjustable lamps, phones with dataports and voicemail and high-speed Internet access. The Doubletrees downtown location puts it in close proximity to a variety of restaurants sure to satisfy any craving. Let the concierge make some suggestions. Or, sample on-site dining at Trofi Restaurant, serving Continental selections with an Italian and Mediterranean flair for breakfast, lunch and dinner. For business or social events, newly renovated meeting and ballroom spaces can accommodate groups of up to 650 people. Check out business center or use the wireless Internet offered in the hotels public areas. Part of the Allen Center business complex, the Doubletree Hotel Houston Downtown provides access to the exciting downtown section of Houston with its corporate centers and nightlife, while also offering travelers an easy route to the Galleria, Medical Center and Reliant Park areas of the city. The newly refurbished hotel is great for leisure visitors ready to watch a baseball game or theatrical performance, or conventioneers heading to the George R. Brown Convention Center. Parking: Yes, there is parking. Valet parking, $22 daily with discounts on weekends.